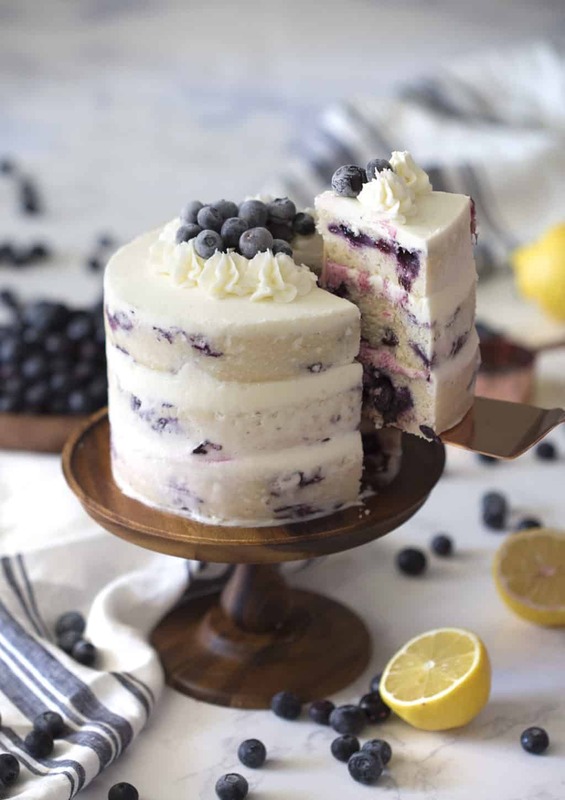 My lemon blueberry cake is bursting with beautiful natural flavors and so refreshing! 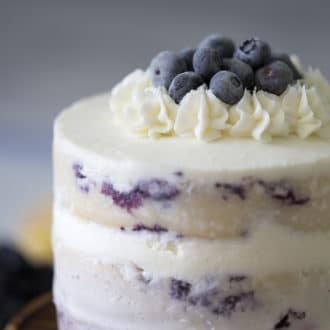 This moist, easy to make cake is filled with delicious blueberry and lemon buttercreams. It’s one of my most popular cakes and a personal favorite so I hope you get a chance to bake one up! 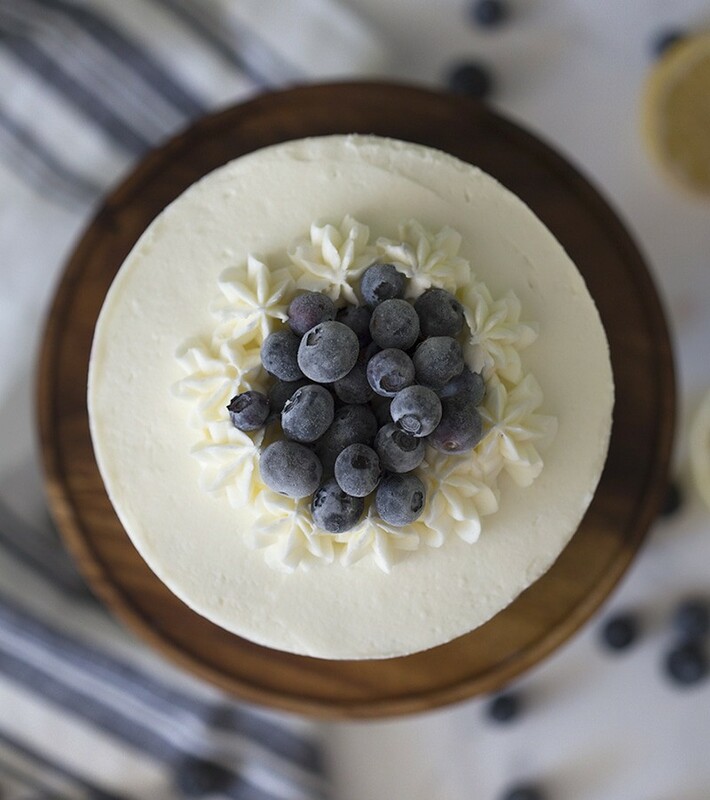 Stop everything and make this cake if you love blueberries! This cake is beyond moist, with the perfect zing from lemon zest and juice. I divided my buttercream into two batches; one is flavored with a blueberry reduction while the other is all lemon. I’m not sure if my meager description is doing the cake any justice but it was soooo good! I really loved it as a naked cake because the cake itself is so tasty it really doesn’t need a lot of frosting, you don’t want to mask the flavor with too much sugar. I have a hint for avoiding berries at the bottom of your pans. Toss the blueberries in a just a dash of lemon juice to moisten the skin a bit then sprinkle with a tablespoon or so of flour. This will prevent them from sinking during the bake. The harder part is making sure the blueberries are separated and not in a big clump when you pour the batter into the pans. Just use a spoon so move them around if you notice a big pile here or there. If you’re wondering how I got such a nice light edge to the layers it’s from using cake strips! They’re wet fabric strips you wrap around the edge of the pan. You can make your own or buy a set here. I love them because they always give me nice flat layers and the outside is never burnt! Check out my video on how to get flat layers to see how they work and how to make your own! 2. Add wet to dry. Fold in blueberries. 4. Beat the butter until light and fluffy. Add the confectioners’ sugar, vanilla and cream. Mix. Add blueberry reduction to about 1 cup buttercream. Transfer to piping bags. 5. Pipe buttercream between each cake layer. 6. Pipe an outer layer. 7. Scrape and smooth with an offset spatula. 8. Add dollops using an 846 tip. 9. 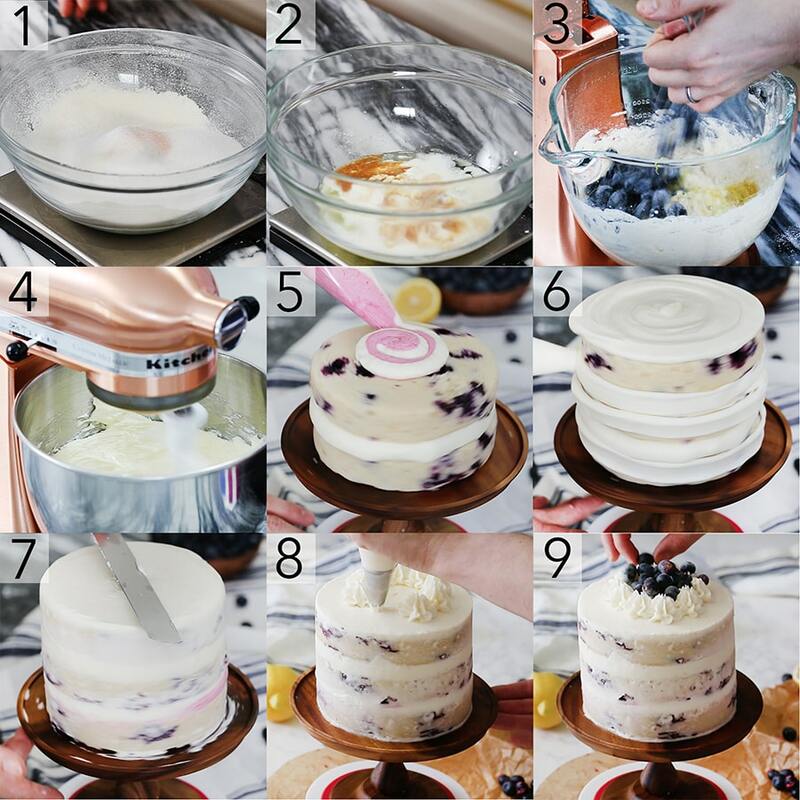 Put frozen berries inside the dollop ring. This moist and zingy lemon blueberry cake is a must make if you have fresh blueberries handy! It's a super-quick and simple recipe that will become a favorite! Preheat oven to 340 degrees F. Butter and flour three 6-inch pans. I use damp cake strips on my pans for more even baking as well. Sift the dry ingredients including the sugar together in a large bowl. In a small bowl, add blueberries and lemon zest. Coat with about 1-2 tbsp flour. Add the wet to the dry and mix until just combined. Fold in blueberry/lemon zest at the very end and mix until just combined. Put ½ cup of blueberries in the freezer. In a small saucepan over medium low heat, combine 1 cup blueberries, 1 tbsp lemon juice, 1 tbsp water and 1 tbsp granulated sugar. Mash and heat for a minute. Bring to a simmer. Simmer until reduced by half. Transfer to a small bowl to chill. Add lemon juice a tbsp at a time until a desired consistency is reached. Transfer about 1/3 cup to a small bowl. Add about 1 tbsp of the blueberry reduction and mix or until you reach a desired color. Transfer blueberry buttercream and around the same amount of lemon vanilla buttercream to piping bags. Snip off the tips of both. Add both bags to one piping bag and snip off the tip. Transfer the rest of the lemon buttercream to a piping bag. Pipe blueberry/vanilla buttercream between each layer. Pipe the plain vanilla around the sides and smooth for a naked crumb coat. Scrape the sides and smooth cake for a naked look. Using an 846 tip, pipe a circle of dollops about 1 inch from the edge of the cake. Add frozen blueberries to the inside of the circle. If you're decorating this as a naked cake halve the buttercream recipe! Or you'll have extra leftover to use for cupcakes! If you're wondering how I got such a nice light edge to the layers it's from using cake strips! They're wet fabric strips you wrap around the edge of the pan. Can this be baked with Cake flour instead? Yes, you can use cake flour! This cake is so delicious. I have to admit, I was a little worried it was going to taste like a big blueberry muffin…it did not. The lemon is absolutely perfect and the sour cream gives the cake the most amazingly moist texture. Thanks so much for sharing. I’m so gad to hear that your cake didn’t taste like one big blueberry muffin! LOL. I’m happy you enjoyed it. Hello!! This recipe looks amazing! I am planning on making a 3 layer cake with 9in pans, would you recommend that I double or triple this recipe? Triple the recipe for 9-inch pans! I don’t have sour cream but only heavy whipping cream. Can I substitute the sour cream with the heavy whipping cream ? Thanks ! You can substitute sour cream with plain yogurt! I do it all the time when I run out and you really can’t taste the difference. Thanks Kate! Definitely and that’s one of my favorite frostings! Just make sure to watch out for instability! Might need a skewer through the center if that happens. I have made this cake 3 times now. Twice yesterday and once a few weeks ago. PERFECTION!! I am considering to have my wedding cake be a blueberry lion cake I am that addicted. Thank you! I understand how you feel. LOL! I love this cake too. I’m happy you enjoy it as much as I do! Everything would be the same! Hope you enjoy! Thank you so much for sharing your craft with all of us! Because of you, I started baking again. My family is thrilled. And you’re amazing! I love you’re whimsical approach to baking. It is clear you have fun with it, the way baking should be. Bravo! Thank you so much for the kind words! I hope you have as much fun baking now as I do! I made this for my friends wedding rehearsal dinner and it was a HUGE hit! I only had 4 oz of cream cheese though so I cut it that recipe in half and added half a recipe of the buttercream used in the vanilla cake recipe and it was DELICIOUS. My friend said that this is the best thing I’ve ever made, hands down. 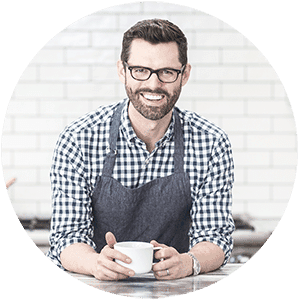 I’ll definitely be trying more of your recipes (and making sure I have enough ingredients beforehand). THANKS!!! I’m happy to hear you tried this cake and it was hit! Which cake do you think you’ll make next?? I have tried this recipe with half butter and half oil so that it doesn’t get too hard in low temp and also with whipped cream frosting instead of buttercream. It was very delicious cake I must say . I love all your uploads . your presentations are so appealing. Hello! SO happy you liked it. You can make it less sweet but maybe try a Swiss buttercream instead of the American version here. This was my very first time making a layer cake and it was fantastic! So very delicious and the perfect size for our family! Thank you John!! Keep up the good work! Thank you so much. I love this lemon blueberry cake. I’m happy to hear you enjoyed it too! Hi, I´ve been watching your videos for some time now, I enjoy each of them so much I even watch most of them more than once 🙂 However, I find it hard to follow some of the recipes because I don´t have a standing mixer. So… I was wondering if you had any suggestion as how to “beat the butter until light and fluffy” without it. I do own a hand blender set (including food processor/chopper and whisk). I want to give this one a try today, it looks amazing!! Also I’ve been dying to use the cake strips (hand made obviously). Using a hand mixer is fine. You want to beat the butter and sugar together until it’s smooth and lighter in color. Amazing! Everyone loved it! Thank you John!! Quick to make too! I did half the sugar and held my breathe but it still turned out great. Thanks John! Love this cake recipe but not crazy about the butter cream I think is 2 sweet can I do Italian buttercream instead? ?